Top choices include Saratoga Tea & Honey Co. and the Whistling Kettle. As temperatures begin to drop, it’s only natural to find yourself craving something that will warm you from the inside out. Sometimes you’re on the hunt for a nip of brandy or bourbon, but other times a cup of tea will do the trick, and provide the calm feeling we crave after a busy summer. Tea is having a great moment following decades of being somewhat overshadowed by specialty coffee. Before you head out to snag that perfect cup and relive your Downton Abbey daydreams, here’s a bit of a primer so you can feel more “in the know” as you sip. First up, tea is second to water in terms of world-wide consumption. So even if Americans seem stuck on coffee, the rest of the world apparently knows what’s what. There are literally shades of tea. Black teas are oxidized. Oolong tea leaves are bruised, then dried. White teas are simply dried, and are often less processed than other varieties. Green teas are steamed or pan-fried, and have less caffeine than black teas — so keep that in mind if you’re caffeine-sensitive. Those glorious fruit and spiced herbal teas, or tisanes, happen to be free of caffeine. Most don’t contain any tea, but are fruit and herbal infusions that work well served cold. Since you want to capture as much flavor as possible, plan on steeping tisanes for at least four minutes, but as long as 15. When it comes to making the perfect cup of tea, always pay attention to recommended steep times. Twinings suggests that bagged tea be steeped for two and a half to three minutes on average. Loose teas, however, should always be brewed in a teapot for as many as seven minutes. Also note that over-steeping can drastically change the taste, even turning green teas bitter. Remember, for ultimate freshness, always keep tea in sealed tins or canisters to prevent moisture and odor contamination. If tea is new to you, or you’re looking for a customized experience, Saratoga Tea & Honey Co. is a great place to start. Fall go-tos include a blend called Istanbul Apple, which is a black tea with cinnamon notes, and Field of Dreams, a caffeine-free option with lemongrass, chamomile, lavender, mint and rose petals that Stevens describes as soothing, but with bright notes and a hint of peppermint. 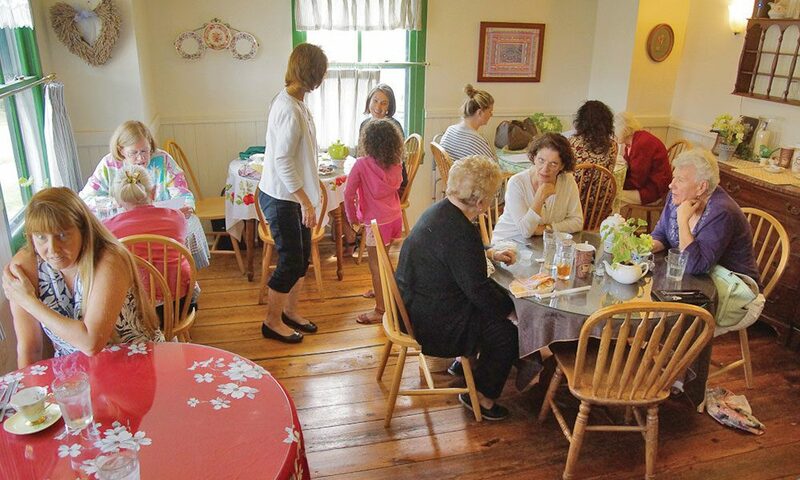 The Whistling Kettle draws a crowd year-round with its incredible variety of hot and iced teas, as well as a near-legendary Afternoon Tea menu, which includes an entrée, as well as soup or salad and a scone or tea bread. When asked to list a top few favorites, Neil Grant, head of support at the Ballston Spa store, has a few in mind. First up is the snowflake blend, which he describes as a black tea flavored with cinnamon, coconut and almond. “It’s kind of like a dessert tea,” he says. In terms of fruity green teas, the goji berry/blueberry/pomegranate blend is another top seller. If you love chai, try Night of the Iguana, which Grant describes as a vanilla chai with caramel and chocolate chip pieces, as well as cocoa. Whether you’re simply in the mood for a Sunday drive, or looking to catch some fall foliage, a trip south will do just the trick. Plan on stopping off at Verdigris Tea & Chocolate Bar in historic Hudson for a cup of something that will warm you up. Since it’s hard to pick just one tea, opt for a sampling and grab some loose leaf to go, she recommends. Plus, Verdigris has baked goods worth sampling, with fan favorites like zingy lemon tarts and coconut cake. Oh, and did we mention there is chocolate? An international assortment of chocolate bars as well as drinking chocolates is on hand if you’re in need of a cocoa fix. If you’re looking to embrace your inner Lady Mary or Dowager Countess following a Downton Abbey marathon, head to Tailored Tea for a proper high tea adventure. There are other selections including one that’s perfect for the little ladies and gents in your life. In terms of standbys and well-loved favorites, Bafaro says his Irish Breakfast and English Breakfast teas are tried-and-true favorites, although his herbal teas are also popular. “We have great flavors like raspberry apple, honey chai and hot cinnamon spice.” He gets his teas from a local blender, Divinitea. Although there isn’t a true tea bar at Divinitea, with over 500 blends to choose from, you won’t hardly miss it. Plus, you can literally walk right in, chat up the owner and taste just about any tea your heart’s set on, brewed to order. Just don’t ask how many options you have. Smith sources her teas, spices and ingredients from around the world and is consistently coming up with new blends that she sells wholesale to shops and cafes just about everywhere, as well as through an online retail store and retail location. As far as what’s most popular for fall, she says you can’t go wrong with any of her apple blends, of which there are a least 20. Her pumpkin spices, cinnamons and chais are all massively popular as well, with her vanilla chai, chocolate chai and Mayan Chai topping the charts. Ginger blends. including ginger citrus and ginger white tea, are also mainstays. “Cinnamon and ginger are two of the biggest herbs I use,” Smith says.